This Saturday another “4 The Love of Books” will be taking place at Festival Coffee in Chester. It’s a wonderful thing to learn what makes writers write. What were their influences? These are a few of mine. To think that people may read what I have written leaves me feeling vulnerable. I can’t see why people would want to read what I have written. Clearly not the sharpest pencil in the pencil case, I now realise I haven’t written Elin’s Air for the reader but for pure self indulgence. I have written because I love words. I have written because I love creative expression. I have written because I love Wales and people; and people in Wales; and God; and history. I also love children’s literature. My love of children’s literature is old fashioned and sublime. I like the tales that are real, redemptive and safe (in the end) and I choose what peril I engage with carefully. I love to read something that will teach and inspire me. This must influence the way I write. Does what we love, influence what we do? I don’t need to answer that. Instead, let me share some of the authors whose work I love. Cynthia Harnett – her historical adventures had me entranced by her accuracy and authenticity. She wrote about ordinary people. As a child, she opened my imagination to life in another time that meant wherever I went I was switched on to wondering how things had once been. I wanted to find the places she wrote about and know everything I could about them. She was an artistic historian. She died before we moved to Thanksgiving Lane (a beautiful address of a home filled with beautiful memories) in Binfield Heath, but it was just up the road from her cottage. 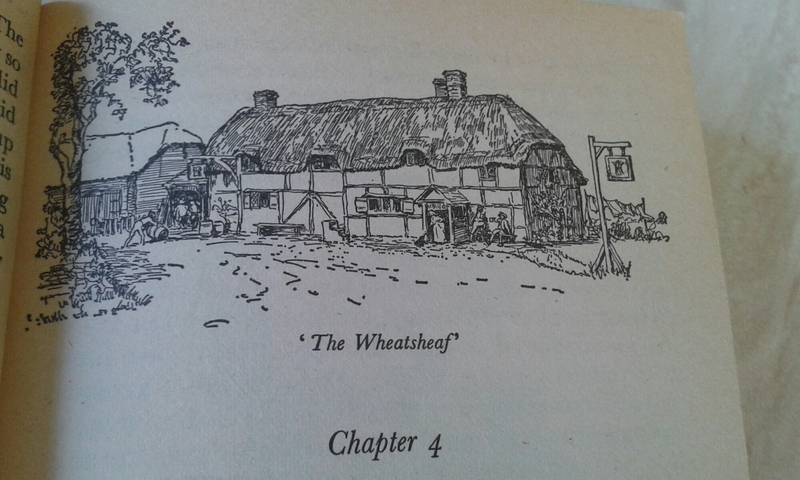 Some of her illustrations are remarkably familiar. The Wheatsheaf or perhaps The Bottle and Glass, Binfield Heath? I have found a press release from the Evening Post, Saturday, October 30, 1971 that was photocopied and tucked into one of her books on my bookshelf. The reporter, Linton Mitchell, writes about her publication of The Writing on the Hearth. She inspired me and I still have a lot to learn from her. Patricia St John – also an author of local interest but one I only met in adult life. She lived and worked, for a time, on the stately home Estate our cottage belongs to and she captures it all in Rainbow Garden. She too died before we moved here. Her writing is also about ordinary people with whom she expresses such depth of love and warmth of humanity that I invariably shed a tear or two. Her stories are redemptive and full of tangible faith that is believable. For me, it is a heart connection. K.M.Peyton – she was part of my “tween” years with the Flambards trilogy. I nod to her “coming of age” influence. She also taught me to consider what life in pre-war, Edwardian Britain might have been like. In adult years, it was to her that I first turned for advice (found on her author page) on how to manage my time and write effectively while bringing up a family. Elizabeth George Speare – again, I only met her in adult years. I have looked to her for inspiration in style, structure and pace. Again she writes about ordinary people with sensitive depth and communicates both the resilience and frailty of humanity well. Her books are ones that have had me reading long past lights out, unable to sleep until they’re finished. They too are historical novels in settings I am unfamiliar with except for The Bronze Bow. Elizabeth Goudge – while I have not written fantasy as she did, she is a master of allegory. She communicates her faith. The Little White Horse is colourful and alive with unforgettable imagery. The reader, immersed in a beautiful place, full of authentic scent and flavour are convinced they are there. Her work breathes and speaks to those who have ears to hear. You are welcome 😊. If you can please visit my blog and let me know what you think about it. It will be really grateful.